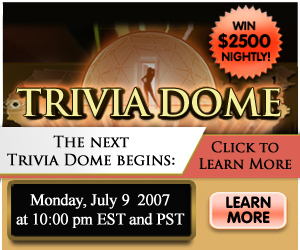 My friend James over at the World Series of Pop Culture informed me that, starting tonight, you can win $2,500 by playing a new game on WorldOfPop.com called "Trivia Dome." This week: Monday July 9th, Tuesday July 10th, Wednesday, July 11th, 2007, and Thursday July 12th. Next week: Monday July 16th, Tuesday July 17th, Wednesday July 18th, and Thursday July 19th. Quick! What does Penny Lane (Kate Hudson) tell William (Patrick Fugit) her real name is in the movie "Almost Famous"?